Every so often, one must read a Young-Adult novel. Especially when there is a cat lady involved, as well as a witty title. 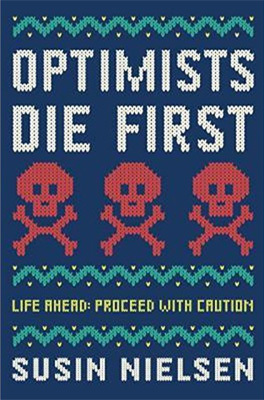 Besides, I couldn’t resist Optimists Die First‘s book cover, which is darn awesome, no pun intended. Optimists Die First, Life Ahead: Proceed With Caution is the story of sixteen years old Petula, a former happy and talented teen whose worldview took a wrong turn when tragedy hit her family. She developed an acute feeling of insecurity, and now sees danger in everything: germs, raw food, construction on her way to school… She even keeps newspaper clippings of what could be seen as creative ways of dying in bizarre accidents. Counselling and group therapy haven’t been helping much, but a newcomer at her school is determined to bring some change. Optimists Die First is a well-executed feel-good novel. The characters are very quirky and likeable, from the cat-lady Mum to the music-nerd Dad to, even, the school principal, a cool guy who likes pets and crafts and even his students. It’s hard to not feel sympathy for the kids in therapy with Petula, considering their respective trauma and how they are, mostly, just really kind and helpful to one another. Everybody is nice in this book, as if Life was the only big B*, which is somewhat simplistic but does feel relaxing. I appreciated the way trauma was treated in this book. Nielsen does a good job showing how a nice person can act awful due to grief or extreme sadness. It was a good point to show that inappropriate counselling or forced group therapy won’t do much help, whereas genuine support from people with similar experience will. I really liked how the teens get creative to help one another to deal with their trauma. On the other hand, Optimists Die First‘s story was very average. First, the plot didn’t take off before the half mark. The beginning was slow and, away from Petula’s flashbacks, not very original. Also, the story features a predictable romance that sounds incredibly hurried and unromantic. Some of Petula’s behaviour felt like a bad case of tantrum, which is a bit late considering she’s 16.